When the Learning Resource Metadata Initiative (LRMI) technical working group started its work it focused on identifying the properties and relationships that were important for educational resources but could not be adequately expressed using schema.org as it then stood. One of those important pieces of information was the licence under which a resource was released, and so the LRMI spec from the start had the property useRightsUrl “The URL where the owner specifies permissions for using the resource.” When schema.org adopted most of the LRMI properties, useRightsUrl was an exception, it was not adopted pending further consideration–not surprising really given the wide-ranging applicability of licence information beyond learning resources. Back in June the good news came that with version 1.6 of schema.org included a license property for Creative Works that does all that LRMI wanted, and more. What does this mean for LRMI adopters? Some adopters of LRMI have already started using useRightsUrl. Such implementations are valid LRMI but not valid schema.org, which means that they will only be understood by applications that have been written specifically to understand LRMI and not by the general purpose web-scale search applications. This is sub-optimal. The good news is that all these options play nicely together, you can have the best of all worlds. I prefer the semantics of the name and definition: a license can include restrictions of use as well as grant rights and permissions. The inclusion in schema.org of the license property is good news for aims for LRMI. If you use LRMI and care about licensing you should tag the information you provide about the license with it. If you already use LRMI’s useRightsUrl or RDFa’s rel=”license” there is no need to stop doing so. A while back I summarised the input about semantics and academic coding that Lorna and I had made on behalf of Cetis for a study on possible reforms to JACS, the Joint Academic Coding System. That study has now been published. JACS is mainatained by HESA (the Higher Education Statistics Agency) and UCAS (Universities and Colleges Admissions Service) as a means of classifying UK University courses by subject; it is also used by a number of other organisations for classification of other resources, for example teaching and learning resources. The report (with appendices) considers the varying requirements and uses of subject coding in HE and sets out options for the development of a replacement for JACS. Of course, this is all only of glancing interest, until you realise that stuff like Unistats and the Key Information Set (KIS) are powered by JACS. ePub metadata what gets shown? One of the issues around eTextBooks is how to describe them, specifically by way of educational metadata in ePub. That’s something that on the face of it shouldn’t be too difficult to address (at least to the extent that we know how to describe any educational resource). One thing that would be useful in demonstrating different choices for educational metadata is an app or tool that will display any metadata found in the ePub package in a sensible way. As a bit of long shot I tried four eBook readers to see whether they would; they don’t. The details follow, if you’re interested, but do let me know if you know of any tool that might be useful. Every year for the past dozen or so years the Department of Information Sciences at UCL have organised a meeting on ebooks. I’ve only been to one of them before, two or three years ago, when the big issues were around what publishers’ DRM requirements for ebooks meant for libraries. I came away from that musing on what the web would look like if it had been designed by publishers and librarians (imagine questions like: “when you lend out our web page, how will you know that the person looking at the screen is a member of your library?”…). So I wasn’t sure what to expect when I decided to go to this year’s meeting. It turned out to be far more interesting than I had hoped, I latched on to three themes of particular interest to me: changing paradigms (what is an ebook? ), eTextBooks and discovery. With the earliest printed books, or incunabula, such as the Gutenberg Bible, printers sought to mimic the hand written manuscripts with which 15th cent scholars were familiar; in much the same way as publishers now seek to replicate printed books as ebooks. In the first presentation of the day Lorraine Estelle, chief executive of Jisc Collections, focussed on access to electronic resources. Access not lending; resources not ebooks. She highlighted the problems of using yesterday’s language and thinking as being problematic in this context, like having a “horseless carriage” and buying it hay. [This is my chance to make the analogy between incunabula and ebooks again, see right.] The sort of discussions I recalled from the previous meeting I attended reflect this thinking, publishers wanting a digital copy of a book to be equivalent to the physical book, only lendable to one person at a time and to require replacing after a certain number of loans. We need to treat digital content as offering new possibilities and requiring new ways of working. This might be uncomfortable for publishers (some more than others) and there was some discussion about how we cannot assume that all students will naturally see the advantages, especially if they have mostly encountered problematic content that presents little that could not be put on paper but is encumbered with DRM to the point that it is questionable as to whether they really own the book. But there is potential as well as resistance. Of course there can be more interesting, more interactive content–Will Russell of the Royal Society of Chemistry described how they have been publishing to mobile devices, with tools such as Chem Goggles that will recognise a chemical structure and display information about the chemical. More radically, there can also be new business models: Lorraine suggested Institutions could become publishers of their own teaching content, and later in the day Caren Milloy, also of Jisc Collections, and Brian Hole of Ubiquity Press pointed to the possibilities of open access scholarly publishing. Caren’s work with the OAPEN Library is worth looking through for useful information relating to quality assurance in open monograms such as notifying readers of updates or errata. Caren also talked about the difficulties in advertising that a free online version of a resource is available when much of the dissemination and discovery ecosystem (you know, Amazon, Google…) is geared around selling stuff, difficulties that work with EDitEUR on the ONIX metadata scheme will hopefully address soon. Brian described how Ubiquity Press can publish open access ebooks by driving down costs and being transparent about what they charge for. They work from XML source, created overseas, from which they can publish in various formats including print on demand, and explore economies of scale by working with university presses, resulting in a charge to the author (or their funders) of about £150 for a chapter assuming there is nothing to complex in that chapter. All through the day there were mentions of eTextBooks, starting again with Lorraine who highlighted the paperless medic and how his quest to work only with digital resources is complicated by the non-articulation of the numerous systems he has to use. When she said that what he wanted was all his content (ebooks, lecture handouts, his own notes etc.) on the same platform, integrated with knowledge about when and where he had to be for lectures and when he had exams, I really started to wonder how much functionality can you put into an eContent platform before it really becomes a single-person content-oriented VLE. And when you add in the ability to share notes with the social and communication capability of most mobile devices, what then do you have? There was also a theme of resource discovery running through the day, and I have already mentioned in passing that this referenced Google and Amazon, but also social media. Nick Canty spoke about a survey of library use of social media, I thought it interesting that there seemed to be some sophisticated use of the immediacy of Twitter to direct people to more permanent content, e.g. to engagement on Facebook or the library website. it’s no use using a language only you speak. Richard went on to speak about the Google Knowledge graph and their “things not strings” approach facilitated by linked data. He urged libraries to stop copying text and to start linking, for example not to copy an author name from an authority file but to link to the entry in that file, in Eric Miller’s words to move from cataloguing to “catalinking”. So was this really about ebooks? Probably not, and the point was made that over the years the name of the event has variously stressed ebooks and econtent and that over that time what is meant by “ebook” has changed. I must admit that for me there is something about the idea of a [e]book that I prefer over a “content aggregation” but if we use the term ebook, let’s use it acknowledging that the book of the future will be as different from what we have now as what we have now is from the medieval scroll. 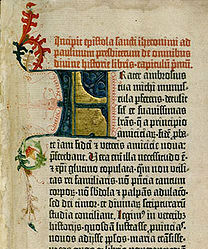 Scanned image of page of the Epistle of St Jerome in the Gutenberg bible taken from Wikipedia. No Copyright. The Learning Resource Metadata Initiative aimed to help people discover useful learning resources by adding to the schema.org ontology properties to describe educational characteristics of creative works. Well, as of the release of schema draft version 1.0a a couple of weeks ago, the LRMI properties are in the official schema.org ontology. audience the educational audience for whom the resource was created, who might have educational roles such as teacher, learner, parent. educational alignment an alignment to an established educational framework, for example a curriculum or frameworks of educational levels or competencies. Expressed through an abstract thing called an Alignment Object which allows a link to and description of the node in the framework to which the resource aligns, and specifies the nature of the alignment, which might be that the resource ‘assesses’, ‘teaches’ or ‘requires’ the knowledge/skills/competency to which the resource aligns or that it has the ‘textComplexity’, ‘readingLevel’, ‘educationalSubject’ or ‘educationLevel’ expressed by that node in the educational framework. educational use a text description of purpose of the resource in education, for example assignment, group work. interactivity type The predominant mode of learning supported by the learning resource. Acceptable values are ‘active’, ‘expositive’, or ‘mixed’. is based on url A resource that was used in the creation of this resource. Useful for when a learning resource is a derivative of some other resource. learning resource type The predominant type or kind characterizing the learning resource. For example, ‘presentation’, ‘handout’. typical age range The typical range of ages the content’s intended end user. Of course, much of the other information one would want to provide about a learning resource (what it is about, who wrote it, who published it, when it was written/published, where it is available, what it costs) was already in schema.org. Unfortunately one really important property suggested by LRMI hasn’t yet made the cut, that is useRightsURL, a link to the licence under which the resource may be used, for example the creative common licence under which is has been released. This was held back because of obvious overlaps with non-educational resources. The managers of schema.org want to make sure that there is a single solution that works across all domains. To promote the uptake of these properties, the Association of Educational Publishers has released two new user guides. There is also the InBloom Tagger described and demonstrated in this video. As the last two resources show, LRMI metadata is used by the Learning Registry and services built on it. For what it is worth, I am not sure that is a great example of its potential. For me the strong point of LRMI/schema.org is that it allows resource descriptions in human readable web pages to be interpreted as machine readable metadata, helping create services to find those pages; crucially the metadata is embedded in the web page in way that Google trusts because the values of the metadata are displayed to users. Take away the embedding in human readable pages, which is what seems to happen when used with the learning registry, and I am not sure there is much of an advantage for LRMI compared to other metadata schema,–though to be fair I’m not sure that there is any comparative disadvantage either, and the effect on uptake will be positive for both sides. Of course the Learning Registry is metadata agnostic, so having LRMI/schema.org metadata in there won’t get in the way of using other metadata schema. I was lucky enough to be on the LRMI technical working group that helped make this happen. It makes me vary happy to see this progress. Lorna and I recently contributed a study on possible reforms to JACS, a study which is part of a larger piece of work on Redesigning the HE data landscape. JACS, the Joint Academic Coding System, is mainatained by HESA (the Higher Education Statistics Agency) and UCAS (Universities and Colleges Admissions Service) as a means of classifying UK University courses by subject; it is also used by a number of other organisations for classification of other resources, for example teaching and learning resources. The study to which we were contributing our thoughts had already identified a problem with different people using JACS in different ways, which prompted the first part of this post. We were keen to promote technical changes to the way that JACS is managed that would make it easier for other people to use (and incidentally might help solve some of the problems in further developing JACS for use by HESA and UCAS), which are outline in the second part. There’s nothing new here, I’m posting these thoughts here just so that they don’t get completely lost. One of the issue identified with the use of JACS is that “although ostensibly believing themselves to be using a single system of classification, stakeholders are actually applying JACS for a variety of different purposes” including Universities who “often try to align JACS codes to their cost centres rather than adopting a strictly subject-based approach”. The cost centres in question are academic schools or departments, which are discipline based. This is problematic to the use of JACS to monitor which subjects are being learnt since the same subject may be taught in several departments. A good example of this is statistics, which is taught across many fields from Mathematics through to social sciences, but there are many other examples: languages taught in mediaeval studies and business translation courses, elements of computing taught in electronic engineering and computer science and so on. One approach would be to ignore the discipline dimension, to say the subject is the same regardless of the different disciplinary slants taken, that is to say statistics taught to mathematicians is the same as statistics taught to physicists is the same as statistics taught to social sciences. This may be true at a very superficial level, but obviously the relevance of theoretical versus practical elements will vary between those disciplines, as will the nature of the data to be analysed (typically a physicist will design an experiment to control each variable independently so as not to deal with multivariate data, this is not often possible in social sciences and so multivariate analysis is far more important). When it comes to teaching and learning resources something aimed at one discipline is likely to contain examples or use an approach not suited to others. Perhaps more important is that academics identify with a discipline as being more than a collection of subjects being taught. It encapsulates a way of thinking, a framework for deciding on which problems are worth studying and a way of approaching these problems. A discipline is a community, and an academic who has grown up in a community will likely have acquired that community’s view of the subjects important to it. This should be taken into account when designing a coding scheme that is to be used by academics since any perception that the topic they teach is being placed under someone else’s discipline will be resisted as misrepresenting what is actually being taught, indeed as a threat to the integrity of the discipline. More objectively, the case for different disciplinary slants on a problem space being important is demonstrated by the importance of multidisciplinary approaches to solving many problems. Both the reductionist approach of physics and the holistic approach of humanities and social sciences have their strengths, and it would be a shame if the distinction were lost. The ideal coding scheme would be able to represent both the subject learnt and the discipline context in which it was learnt. The identifiers are globally unique and unambiguous, they can be used in any system without fear of conflicting with other identifiers. The subjects can be referenced globally by humans by from websites, emails, and by computer systems in/from data feeds and web applications. The subjects can be used for semantic web approaches to representing ontologies, such as RDF. These allow relationships such as subject hierarchies and relationships with other concepts (e.g. academic discipline) to be represented independently of the coding scheme used. An example of this is SKOS, see below. Setting up a web service to provide suitable information. Anyone connecting to that URL would be redirected to information that matched parameters in their request. A simple web browser would request an HTML page and so be redirected to http://id.jacs.ac.uk/H713.html; web applications would request data in a machine readable form such as xml, rdf or json. In this example jacs: is shorthand for the JACS base URI, http://id.jacs.ac.uk/ as suggested above; rdf: and skos: are shorthand for the base URIs for RDF and SKOS. This triple says “The thing identified by http://id.jacs.ac.uk/H713 is a resource of type (as defined by RDF) concept (as defined by SKOS)”. Other assertions can be made about the resource, e.g. the preferred label to be used for it and a scope note for it. (The resource identified by the URI http://example.org/123 is about the subject identified by jacs:H713).